GRAMMY® Award-winning multiplatinum powerhouse Maroon 5 are one of pop music’s most enduring artists and the 21st century’s biggest acts. To date, the universally renowned Los Angeles band have achieved three GRAMMY® Awards and become “the most successful group in the history of the Billboard Hot 100” with 13 Top 10 entries. Maroon 5 have earned over twenty Top 40 hits making them the only band to ever do so, sold over 36 million albums and 48 million singles worldwide, and earned gold and platinum certifications in more than 35 countries. Maroon 5 once again ruled pop with 2012’s Overexposed. All of its singles became chart-toppers and, along the way, they set a record for most number ones (six in total) by a group in the Top 40 chart’s 20-year history. They also launched one of the year’s highest grossing tours, generating over 50 million dollars in ticket sales. During 2014, the group’s album V bowed at #1 on the Billboard Top 200 and yielded “Maps,” “Animals,” and “Sugar”—which each captured #1 on the Top 40 Chart. Rolling Stone wrote, “Adam Levine and Co. continue their top 40 takeover with a set of irresistibly sharp hooks…The 11 songs here are precision-tuned and lustrously polished, jammed with hooks and choruses that build a man cave in your brain.” The music video for the band’s chart-dominating and GRAMMY® Award-nominated single "Sugar" notably amassed over two billion views to date—making it one of the most-viewed videos of all time. Maroon 5 set the stage for their 2017 offering by releasing a pair of chart-topping standalone singles. 2016’s “Don’t Wanna Know” [feat. Kendrick Lamar] went Top 10 in 15 countries, scored upwards of 427 million YouTube/VEVO views and became one of the first recipients of the iHeart Radio Titanuim Award for an astounding 1 billion audience spins on iHeartRadio stations. The follow-up “Cold” [feat. Future] cracked over 300 million streams and 144 million YouTube/VEVO views. Maroon 5’s released their 6th studio album, Red Pill Blues, in late 2017 via 222/ Interscope; executive produced by J. Kash and Adam Levine. The album features special guest appearances by SZA, Julia Michaels, A$AP Rocky and LunchMoney Lewis, includes a 10-track standard edition, as well as deluxe version. The debut single off the album, “What Lovers Do,” [feat. SZA] introduced the band’s latest body of work with a proverbial bang; accumulating over 663 million Spotify streams and 345 million YouTube/VEVO views. The band’s follow up single was the highly anticipated track “Wait,” which quickly climbed up the Top 40 and Hot AC radio charts and already clocked over 134 million Spotify streams. “Girls Like You” ft. Cardi B, Maroon 5’s newest hit, quickly rose to the top of the charts. The single hit #1 at Top 40, #1 at Adult Pop, #1 on the Billboard Hot 100 for seven consecutive weeks and reached #1 on iTunes and Spotify, all while accumulating over 648 million Spotify streams and over 1.7 billion YouTube/ VEVO views. The single has gone on to become the longest-running song on the Billboard Hot 100 Top 10 and is notably the most-watched video on VEVO in 2018. The band recently finished 2018 as the biggest act on U.S. radio (according to Nielsen Music). 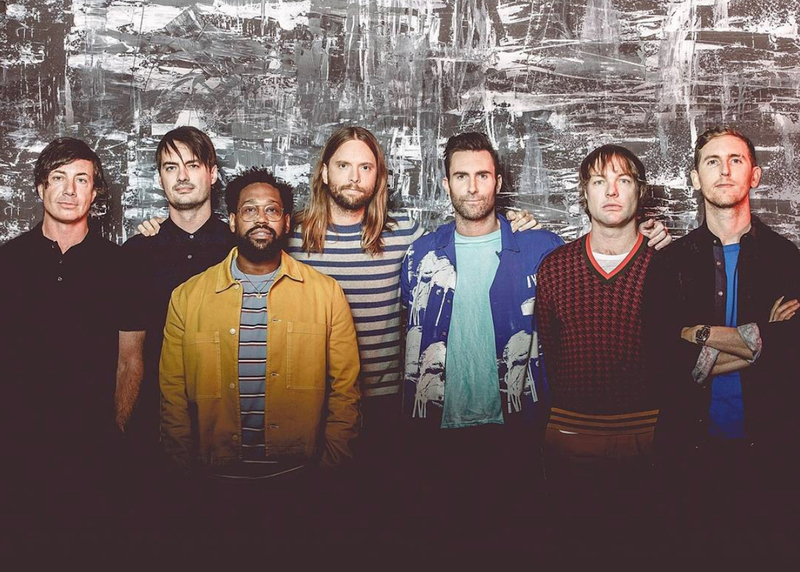 The group’s songs amassed 8.58 billion audience impressions across all monitored radio stations, which included 1.95 million plays of Maroon 5’s music. Maroon 5 took center state at the Pepsi Super Bowl LIII Halftime Show on February 3, 2019.